graduate from cultural studies, theatre direction and applied theatre studies in Giessen. He is currently working on his doctoral dissertation in the Chair of Media Ecology in Potsdam and in the Institute of Theatre and Media Arts at the Adam Mickiewicz University in Poznań. He has worked as theatre director, culture animator and curator in Germany and Poland. He has published texts in Polish and international monographs. He is interested in a broadly conceived theatre politics, performance ecology and theories of transculturality. He is a member of the Poznań branch of the Political Critique. His research is supported by the Heinrich Böll Foundation in the form of a three-year doctoral scholarship (2016–2019). 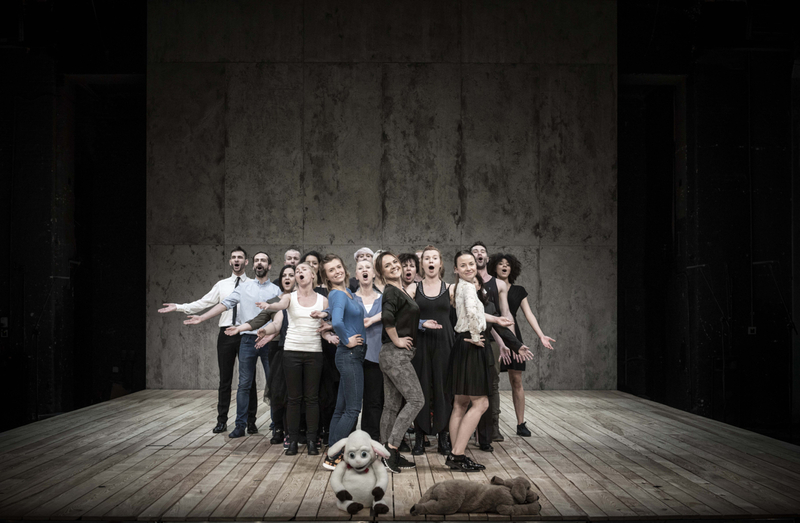 THE CONSTITUTION FOR A CHORUS OF POLES, devised, directed and written by Marta Górnicka, premiere: 1.05.2016, Nowy Theatre in Warsaw. Photographer: Robert Rumas. In the present text, I would like to examine images of ‘nation as community’ in Marta Górnicka’s theatre. By analysing the performative reading of Konstytucja na Chór Polaków [Constitution for a Chorus of Poles] and the production of Hymn do Miłości [Hymn to Love] (Warsaw, 2 May 2016 and 21 January 2017, respectively), I would like to argue that Górnicka’s theatre deliberately comes to grips with the category of Polish nationality, in that it not only alludes to such crucial artefacts of a nation as constitution, national anthem or poetry that is a vital part of the Polish cultural canon – but also makes references to current political developments, both in Poland and across Europe. The chorus plays a unique role in Górnicka’s theatre: regarded as an institution separating diegetic universes, it presents a prismatic image of a community in which the concept of what is recognised as alien and our own is reconfigured. In addition, the chorus plays the role of a critically minded character, exposing the current rise of nationalist tendencies, and the aporias of our liberal democracy. An enormous projection reads: ‘Concerned for the well-being of our homeland and its future’. We aren’t in Parliament or at the Constitutional Tribunal, Poland’s highest constitutional court. The phrase – the opening words of the Constitution of the Republic of Poland – is displayed on the rear wall of the large, recently opened auditorium of Nowy Theatre, in Warsaw’s Mokotów district. It’s 3 May 2016, and the Third of May Constitution Day is being celebrated in Poland. On this day in 1791 – two hundred twenty-five years ago – the constitution of Poland was ratified at the Royal Castle in Warsaw: the first document of its kind in Europe (known as the Polish-Lithuanian Commonwealth Government Act). A performative reading of Poland’s present Constitution is about to begin. Poland’s most important legal act is being read out by fifty-five performers - the people of Warsaw; the young and the elderly; those who fit into the statistical norm of the ‘average Pole’ and those who far exceed it. 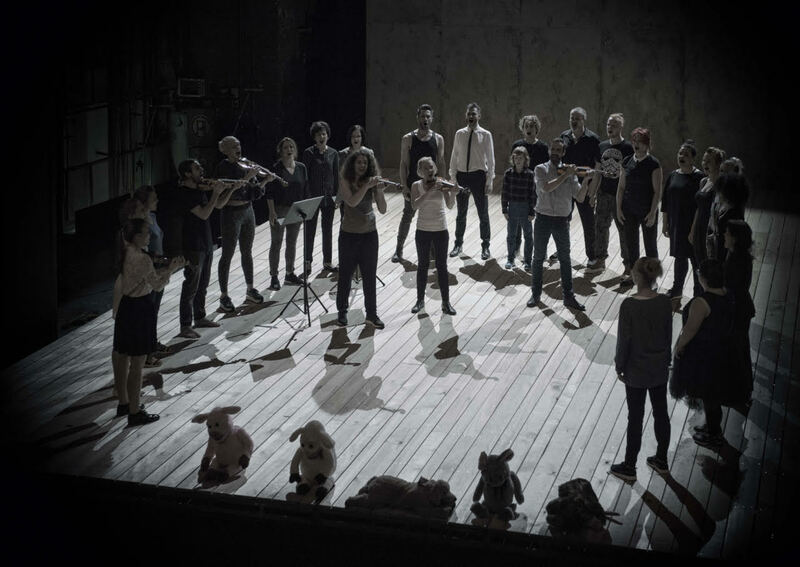 All these individuals are taking part in the project Konstytucja na Chór Polaków [Constitution for a Chorus of Poles] devised by the director Marta Górnicka. Several months later, on 21 January 2017, this time in the city of Poznań, the audience is presented with another text: ‘Poland has not yet died, so long as we still live’, the opening verse of the earliest version of ‘Mazurek Dąbrowskiego’ [‘Dąbrowski’s Mazurka’], Poland’s national anthem. Excerpts from the anthem – both its archaic versions and present-day rap covers – are being recited by a group of more than twenty people, born in Poznań and those who’ve chosen the city as their home, at the outset of another Górnicka work: Hymn do Miłości [Hymn to Love] in Poznań’s Polski Theatre. 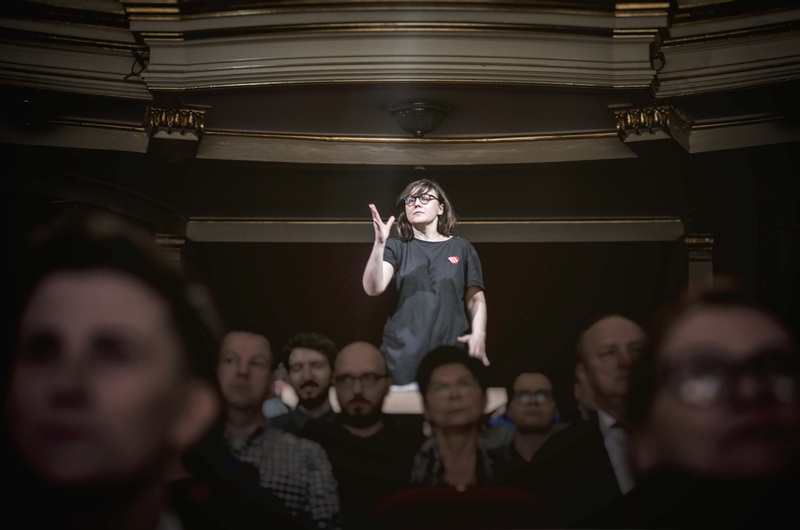 In both cases, a diverse group of people take to the stage to speak their minds – about their country, and about the idea of the Polish nation: commenting and debating, speaking, shouting and whispering about it. However, when it comes to Constitution for a Chorus of Poles what moves the chorus to speak, it would seem, is its openly declared concern for Poland’s future; in that case, nation is regarded as an idea which one can relate to in a certain way, drawing nearer to it or distancing oneself from it. In Hymn to Love, nation seems to acquire organic qualities: the collective body of the chorus comprises a ‘living’ system, at once dependent on the choristers who are integrated in their speech act, and a prerequisite for their existence. Professional actors are but a portion of both ensembles. For the most part, the choruses are made up of amateur performers selected in auditions and appearing on stage for the first time in their lives. What’s more, in Warsaw and in Poznań, the choruses are made up of people who are very diverse indeed. Different ages and genders are represented, different skin colours, facial features and styles of dress. HYMN TO LOVE, devised, directed & written by: Marta Górnicka, premiere: 21.01.2017, Polski Theatre in Poznań, Co-producers: the Chorus of Women Foundation, Polski Theatre in Poznań, Ringlokschuppen Ruhr, Maxim Gorki Theater. Photographer: Magda Hueckel. A plethora of studies exists of the category of Polish nationality and of Polishness as a representational category: a performative concept which is being created and staged over and over again. It may suffice to mention works by Dariusz Kosiński, who states in his Teatra polskie that Polish national identity is ‘of an exemplarily dramatic-representational nature’4 – in other words, what is unique about it is that national identity is being ‘performed’ in public. While Kosiński succeeds in adopting that perspective in outlining characteristics of what might be considered a certain image or idea of ‘Polishness’ and of changes which occur within this image or idea, he fails to pose the question of who the subject of these Polish storiesmight be. I should like to reverse that perspective. By looking at the Górnicka works introduced above, I shall try to offer a systematic account of subjective configurations which have to do with nationality. Of interest here are aesthetics, as well as the institutional aspect. On one hand, I would like to examine stage mechanisms, to look into how ‘community subject(s)’ are created and represented on stage in Górnicka’s works. On the other, I seek to demonstrate that aesthetic transformations in this instance have a strong impact on the political aspect of theatre, and on its reality as an institution. I find it vital that subjectification processes are analysed on that plane, at the level of national as well as global politics. I will argue that Górnicka’s most recent efforts aim to work through the category of subjectivity: at the level of both the ‘national’ (that is, Polish) and the European communities. At the same time, these recent works pose questions about the terms that need to be set to make diverse society (im)possible. Emerging director Marta Górnicka made her debut in 2009, at the Theatre Institute in Warsaw, where she staged TU MOWI CHÓR: tylko 6 do 8 godzin, tylko 6 do 8 godzin [This Is the Chorus Speaking: 6 to 8 hours only, 6 to 8 hours only]. The production elicited enthusiastic responses from audiences and critics, and its form set the model for the director’s subsequent artistic efforts. The staging of This Is the Chorus Speaking marks the start of Górnicka’s work with stage choruses; that debut performance has led her to develop her own language, which has depended on getting larger groups of non-professional actors in Poland and abroad to work with their voices and body movements.5 For Górnicka, working with these choruses had been a conscious step in the direction of political theatre, a kind of theatre which, according to her, is moving away from the character in drama and towards working with various forms of the collective on stage.6 What’s more, the political aspect of Górnicka’s first two chorus-based works (This Is the Chorus Speaking and Magnificat, which premiered on 27 June 2011 at the Theatre Institute in Warsaw) hinged on the fact that the chorus was made up entirely of women7. Trailer for THIS IS THE CHORUS SPEAKING, concept and direction: Marta Górnicka, produced by Zbigniew Raszewski Theatre Institute. What lies at the very heart of action here is the dispute about what is communal and what is individual: both in relation to the body and in the conceptual matrix that shapes the materiality of women’s bodies and their voices. 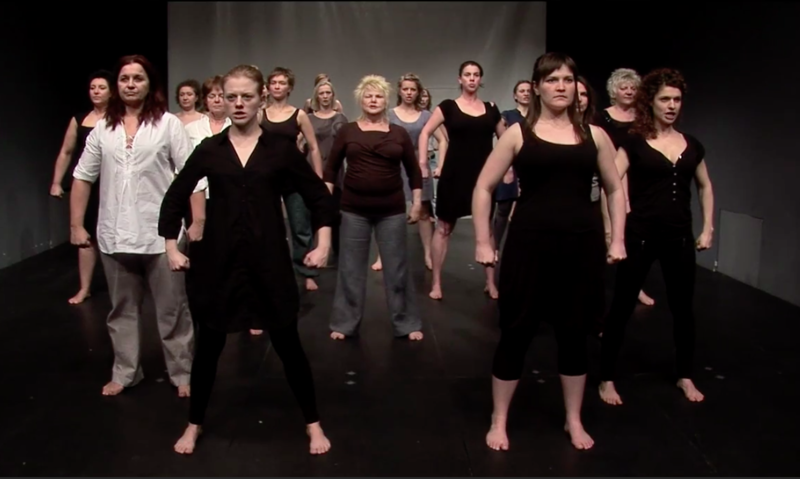 The productions in question are not only a representation of the female ‘subject in crisis, a subject aware of its own ambivalence’,13 but above all reveal how female subjects are grappling with the category of ‘femininity’, a category continually undermined and reconfigured by the choristers (collectively as well as individually) throughout the performance. The stage work of the women comprising the chorus can thus be described as profoundly ideological work: the chorus’s emancipatory as well as political power does not lie in the fact that women ‘took the stage over’ or ostensibly ‘won it back’ for themselves. Instead, what constituted the power of the chorus was the reconfiguration of the notion of ‘woman’ which had been structured by the models of patriarchal power. Rather than the place where women are represented, the stage became a platform for debate with the objective of defining what a woman may be. When calling the work of the choruses ideological, one needs to add that it is also strictly performative: rather than concerns with representing certain themes, qualities or essences, it is concerned with that representation being constantly constituted and redefined. According to a definition proposed by Judith Butler (to state one example): ‘[W]oman itself is a term in process, a becoming, a constructing that cannot rightfully be said to originate or to end. As an ongoing discursive practice, it is open to intervention and resignification’.14 In keeping with Butler’s insight, Górnicka’s ‘emancipatory’ works – that is, This Is the Chorus Speaking and Magnificat –must be regarded as productions which are less preoccupied with ‘releasing’ a predefined essence of woman than with the subjectification of women: becoming15 a woman amid the ongoing dispute about redefining women’s bodies and the categories which describe these bodies as ‘female’. HYMN TO LOVE, devised, directed & written by: Marta Górnicka, premiere: 21.01.2017, Polski Theatre in Poznań, Co-producers: the Chorus of Women Foundation, Polski Theatre in Poznań, Ringlokschuppen Ruhr, Maxim Gorki Theater. This overt tension between representational and performative discourse enables us to take note of stage mechanisms devised by Górnicka then put to work both in the earlier productions and the later ones – with Constitution for a Chorus of Poles and Hymn to Love falling into the latter category. There is, howeverone crucial difference between Górnicka’s earlier and later works: her earliest productions showed the process of female subjectification by means of women’s bodies, clearly drawing audience attention both to the subject at work during the performance and the object, the theme on which these bodies worked: the category of ‘femininity’. Underlying the early works was the transformation of an ostensible analogy between discourse and the body. In later productions, such coherence between performers and the category that denotes them is no longer in place, from which it follows that it becomes impossible to analyse one group of marginalised individuals and thus regard the more recent productions as emancipatory projects. The common denominator of people appearing in Constitution for a Chorus of Poles and Hymn to Love is their essential diversity – which means that at the level of perception it becomes impossible to encapsulate the choristers within one ‘signifier’. What needs to be examined is how this absence of a signifier influences the reception and comprehension of subjectivity. Thus, as far as methodology is concerned, it is imperative that we move away from examining the order of representation, and opt instead for researching the performative process of subjectification – the process of becoming a subject, as well as that of becoming a community. In this way, we will not only grasp political implications of Górnicka’s works, but we will also be able to return to the opening question of the relationship between the category of nationality and its subject. I propose to look at the chorus, focusing on its stage existence and the images of its transformation rather than its essential message. One opportunity to do so presents itself in the opening scene of Constitution for a Chorus of Poles, alluded to above: below the projection reading ‘Concerned for the well-being of our homeland and its future’ we see a group of fifty-five people who differ from one another in terms of almost every conceivable identity category. They stand in a single row, filling the breadth of the stage along its rear wall, watching the audience entering the auditorium and taking their seats exactly opposite. Once seated, viewers for their part begin to examine physical and symbolic relations between the chorus, the title of the performance (describing the chorus as a chorus of Poles), the words seen on stage above the chorus – and the audience themselves. As an institution that stands between audience and drama, the chorus has come to play its cultural and political role – that of creating its audience – by exposing and commenting on the diegetic framework.20 The framework is exposed quite literally: the audience is confronted with the chorus as a group of people who are neither ‘in costume’ nor in any way situated in a fictional context. By reflecting the gaze of the audience, the choristers emphasise that the boundary between fiction and reality is not determined by the existence of the dramatic text.21 This boundary is a feature of theatre as an institution: an institution which changes the framework and the context of our reception by defining a certain topology of the stage or, in other words, the relational arrangements between audience, performers and architecture.22 Under no circumstances should the fact that the choristers take the role of ‘themselves’ be confused with their everyday identity: rather, it must be received precisely as a role, defined by the context of the stage: in other words, by the architectural, aesthetic and institutional dispositive.23 Thus the process of becoming a (stage) subject, the reconfiguration of the logic of identity representation takes place at the institutional-diegetic level, at the level of conventional fiction – that is, within the framework that has been accepted by the audience and emphasises the fictional nature of stage subjectivity. 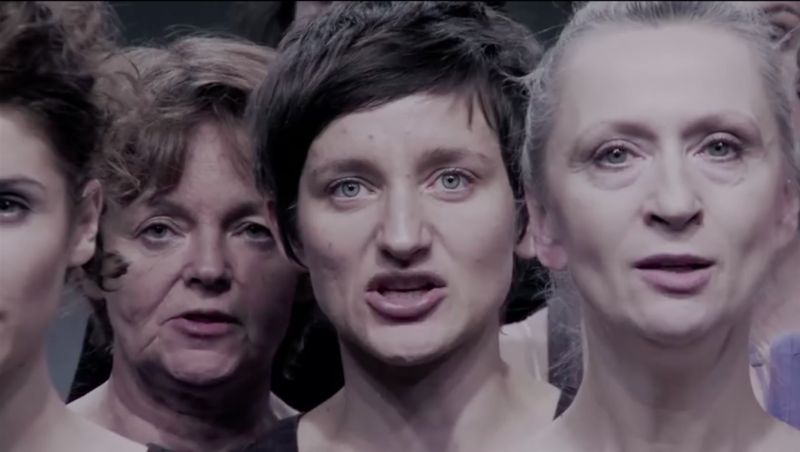 Trailer for THE CHORUS OF WOMEN | MAGNIFICAT, devised and directed by Marta Górnicka, produced by Zbigniew Raszewski Theatre Institute. Marta Górnicka speaking abou her works, after: Culture.pl. As I have outlined above, the cognitive framework in question is the framework of the stage and of theatre as an institution – most important, various immanent aesthetic and architectural contexts or, in another formulation, the map of spatial relations. Topology is what determines how relations between exception and norm play out. There is, however, another context, within which the relationship between audience and chorus takes on an additional significance: the debate Górnicka engages us in has at its core the definition of the concept of the Polish nation. Not only does that concept give a name to the chorus on stage, it also constitutes the structure shaping the cognitive and political field between exception and norm: in other words, between stage chorus and audience. A ‘chorus of Poles’ is identical neither with the group of people on stage nor with the group that is the audience: instead, it is the conceptual matrix structuring their relationship. As a category, this ‘chorus of Poles’ forges the mutual relationship between exception and norm within the theatre as institution. Here, the function performed by that category is being questioned and staged. Thus what’s at stake in Constitution for a Chorus of Poles is the question of what that chorus is, and of what it might be as a concept that divides bodies and lends them structure. THE CONSTITUTION FOR A CHORUS OF POLES, devised, directed and written by Marta Górnicka, premiere: 1.05.2016, Nowy Theatr in Warsaw. Photographer: Robert Rumas. The diversity of performers comprising the institution of a chorus in Górnicka’s work becomes an explosive issue: the critical force of the performances fails to target state policy on dealing with a single, clearly defined, marginalised group. By exposing the mechanisms of biopolitics, the chorus model in Constitution for a Chorus of Poles defies biopolitics as such. As a model of the collective, diversity seeks to do away with the inner biopolitical split: not by annihilating bare life but by incessantly duplicating boundaries and differences within the collective form. The model presented here is relevant to choristers who are defined by law and included in the matrix of concepts that divides and shapes their bodies in relation to the audience. Górnicka, however, has still another course of action in mind. The chorus – comprising women, children, men, a queer person, people with and without disabilities – begins to speak: starting with a single voice and gaining strength as subsequent people join in, the chorus reads out the preamble to the Constitution of the Republic of Poland. The words ‘of the Republic of Poland’ are reiterated many times – after which the choristers scatter across the stage, disrupting the uniform stage order of the chorus. As a result, the chorus becomes a set of voices uttering isolated fragments of texts comprising the preamble. The phrase ‘of the Republic of Poland’ can be heard above the polyphonic symphony; it is gradually superseded by the words ‘We the people of Poland’. These are no longer uttered in unison, instead coming alternately from left and right. Two counter-choirs are formed on stage, locked in a symbolic battle for the right to be included in the category of ‘the people of Poland’. The switch from the phrase ‘the Republic of Poland’ to ‘We the people of Poland’ draws our attention to the distinction between the two concepts: in this approach, ‘nation’ is a phrase that sparks off antagonisms, divides the community and becomes a category employed to produce things which are either ‘our own’ or which are ‘alien’. The ‘Republic’, on the other hand, is what it talks about: a thing of the public, a respublica. To grasp the significance of that term, it is worth referring to the crucial implication of the ‘res publica’ as identified by Martin Heidegger: the res is not equivalent to an object the subject is faced with. The res is what ‘concerns’ (angeht) the citizen; citizens gather around it to negotiate, debate and arrive at common ground.31 The res is what produces a network of shared relationships within discourse. The res publica can be regarded as a dynamic category, at once creating and constituting public discourse. At the centre of the res publica is the question of discourse as a dynamic practice, as an unfinished process made up of a multitude of different voices, and not exhausted by the dispute of mutually antagonising concepts. To highlight the dynamic aspect of the concept of the Republic of Poland is to state implicitly that the identities of those involved in the discourse on what is ‘communal’ need not be unequivocally defined. The individuals in question begin to relate to one another and become subjects in relation to the res publica; that is, to the discourse they have in common. Thus, when in the final scene of the performance the chorus keeps repeating the word ‘good’ (part of the phrase ‘A citizen of the Republic of Poland has the duty to remain faithful to the Republic of Poland and show concern for the common good’, from Article 82 of the constitution), the focus is not on the quality of the things that are common but on their interpersonal aspect, which creates communal discourse. In addition, the recurrence of the word ‘good’ brings home to us the fact that the document in which the common good is mentioned – that is, the constitution – is the foundation of communal discourse: the founding act which is only capable of defining how discourse will come into being when it becomes a performative act. Understood in these terms, both the text of the Constitution of the Republic of Poland and of Constitution for a Chorus of Poles become performatives, demarcating the community in question only as it is being enacted. During the performance, the chorus not only reads out the text of the constitution33 but shapes it and comments on it in different ways, placing itself in relation to it and producing differing contexts in which the text can be received – not least by alluding to current political circumstances. 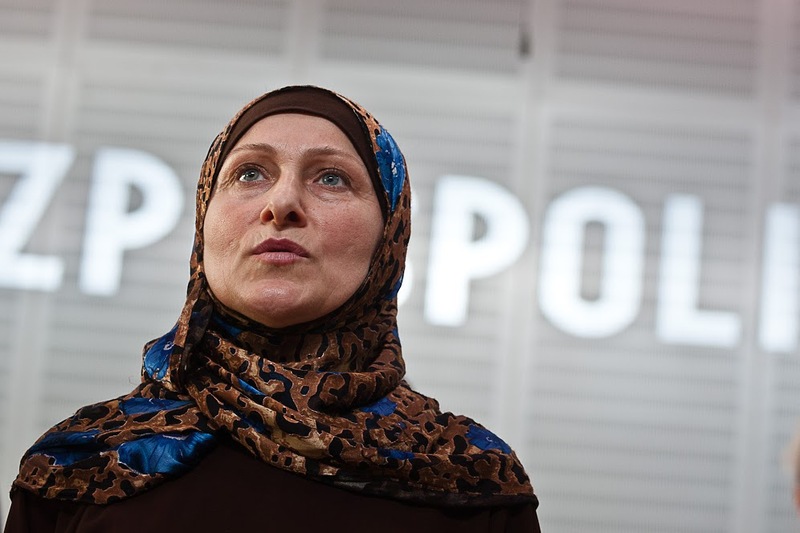 It can suffice to mention the most obvious example: a woman in a hijab reading out Article 56.2 (‘A foreign national seeking sanctuary from persecution in the Republic of Poland may be granted the status of a refugee, in accordance with the international agreements binding the Republic of Poland’) undermines the present stance of the Polish government, whose refusal to take in Syrian refugees is motivated by those refugees’ religious identities. The reiteration of Article 79.1 (‘Every individual whose constitutional freedoms have been violated has the right, within the rules stipulated by the relevant Act, to bring a complaint to the Constitutional Tribunal regarding accordance with the Constitution [...]’) set against the cacophony of ‘freedom’ being repeatedly shouted is in turn a reference to the crisis surrounding the Constitutional Tribunal. That crisis was provoked by Law and Justice and concluded with the governing party imposing changes among the Tribunal judges: the result was a crucial infringement on governmental separation of powers. The text of the constitution does not determine a citizen’s legal subjectivity from top down; instead, it becomes a performative matrix for the law in the sense of applied (practised) law.34 The principle of top-down regulations in force within specific social groups is not at work here, rather that of an a personal mechanism: a mechanism, in other words, which takes no notice of gender, origin, religion or sexual orientation. Taken performatively, the constitution does nothing else but emphasise fidelity to the republic (or the res publica) and concern for the common good; which is to say it is an immanently democratic declaration, placing at its heart the essence of communal discourse as such. The stage chorus, therefore, does more than simply represent that mechanism. The reading aloud and ‘performing’ of the Constitution of the Republic of Poland is in itself a reiteration of the performative founding act; on the two hundred twenty-fifth anniversary of the first Polish constitution, it is a test of whether the principles of constitutional democracy are still in place in 2016. That test takes place in the institution of theatre, which – by the power of producing ever-new topological arrangements – enables that performative democracy to be worked through and tested. What’s more, that test takes place within the institution of the chorus as a medium involved in negotiating the spheres on the two sides of aesthetic and political reality. The question of the biopolitical implications within the reconfiguration of the aesthetic and institutional topology recurs in Hymn to Love. 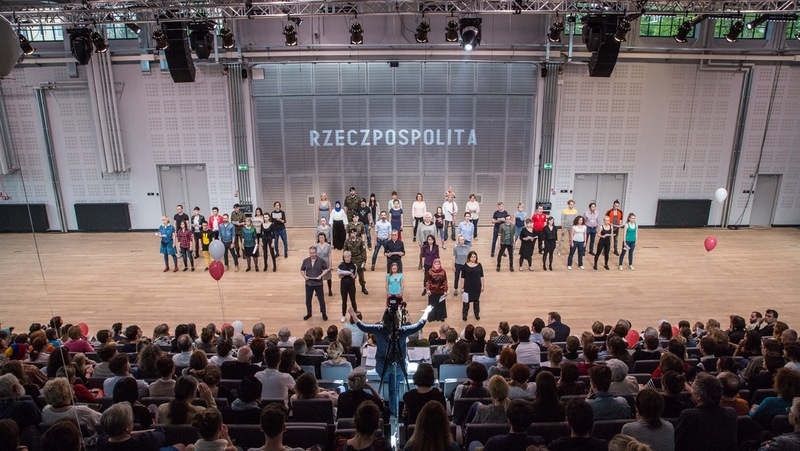 Constitution for a Chorus of Poles had demonstrated the sovereignty of that biopolitical power which keeps citizens apart, while undermining that mechanism by constructing the common good on stage as a performative-discourse space within immanent democracy. One could also describe that kind of politics, after Oliver Marchart, as post-foundational politics: that is, politics which does not depend on an underlying monarchist, religious or ethnical basis – an essential-identity basis,35 in other words – which provides it with a metaphysical foundation. The diversity of performers comprising the chorus was an expression of that mechanism, in that performing the constitution was an illustration of the fictive self-founding process. Being an autopoietic act, the performance exceeds – indeed, it negates – identity politics. The performative process of Constitution for a Chorus of Poles was an experiment in post-foundational democracy in actu. Hymn to Love is made up of excerpts from various national songs, patriotic poems and advertising slogans. The director describes her work as a ‘monstrous National Songbook’, in which‘Dąbrowski’s Mazurka’, ‘Katechizm Małego Polaka’[‘Catechism of a Young Pole’, a well-known patriotic poem for children] and ‘Warszawianka 1831’[a patriotic songwritten by Casimir Delavigne and translated by Karol Sienkiewicz], have all been adapted. In Hymn to Love, Górnicka confronts a group of diverse performers with symbolically charged songs which are paramount for ‘being’ Polish, and which are both the result of and the triggering mechanism for artefacts of a putative ‘imagined community’. While in Constitution for a Chorus of Poles the sovereignty reference that structures the field between exception and norm had been clear, yet stated explicitly only once – in the production’s title – Hymn to Love resorts to the power of national songs to refer us to the past, to the imagined Polish tradition capable of deciding in no uncertain terms who embodies the norm, and who the exception. The fact that a chorus of diverse people sings texts allegedly uniting them introduces an element of contrast. Not unlike Brecht’s Verfremdungseffekt, such a combination reveals deep phantasmatic connections that cause national songs to amalgamate with the body that sings them. Song becomes a vehicle for an ideology of unification, described by Jean-Luc Nancy as ‘immanentism’: one of the characteristics of totalitarian states.37 This ideology places at its heart the image of the nation-body, where all individuals are connected to form one communal gesture; all manner of diversity within that body is done away with – as is, in consequence, any antagonistic-discourse space. 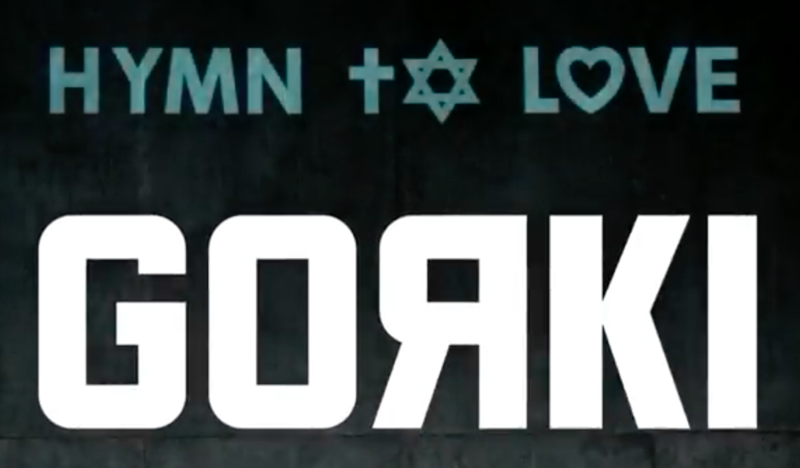 By placing national songs side by side with belligerent cries and slogans seen as having links to terrorist attacks, circulating on the Web and propagating hate speech, Górnicka not only brings these two tiers closer together, but also exposes the objective of the biopolitical machine. Uncovered mechanisms of phantasmatic-identity ideology turn against the singing people: by means of songs, a diverse chorus is symbolically put to death. The chorus falls victim to what it has itself produced; it bows under the weight of things that are supposed to bring about unification. As political correctness negates discourse, afraid of confronting implications and subject matter which undermine the enlightened individual’s self-image, it produces a society where ostensible diversity and tolerance are reduced to appearances. This is evidenced in one of the most perversely powerful scenes of the production: a handsome young man emerges from the chorus – which keeps repeating the overlapping sound bites quoted above – and asks a woman with Down’s syndrome to dance. The scene works as a deliberately naive, unmediated manifestation of harmony between individuals who, by the power of their performative declaration, overcome divisions demarcated by ‘the exception’ and ‘the norm’. Yet the affirmed diversity may in this case seem little more than appearances: the man not only initiates the dance, he also outclasses his partner when it comes to grace and agility of movement, manipulates her body and, as a result, objectifies the disabled performer. It’s possible to read the dance as a declaration of freedom but one may just as well see it as a representation of a society in which tolerance is but a mask, and political correctness another form of violence. Górnicka’s work, however, does more than simply make an implicit reference to the theme of the Shoah – that is to say, the spot in history which Agamben regarded as the paradigm of modern biopolitics.43 The poster for Hymn to Love shows a camp orchestra, made up of prisoners of the Janowska concentration camp in Lviv, playing on the train ramp as a new transport of prisoners arrives and is subjected to selection.44 The photograph is re-enacted towards the end of the performance: the performers gather on stage in a half-circle, for the first time looking noticeably away from Górnicka who, as in all of her performances, conducts the chorus, and pick up violins so that they can play and sing from Bach’s St. John’s Passion. What happens here amounts to more than simply severing ties with the coryphaea, the conductor. On a formal plane, as well, the chorus abandons its role of a performative institution standing between the audience and the presented world, and becomes part of the order of representation. It reminds us not only of Auschwitz as the ‘square one’ of contemporary history, but also gives a disturbing slant to the opening scene of the performance: the image of Polish society that in Constitution for a Chorus of Poles was still boldly manifesting its constitutional right as the performative guarantor of diversity, is suspended in Hymn to Love in the symbolic void of a concentration camp. Rather than solely a place of death, the camp is a space of life stripped bare: an existence between life and death, and outside discourse. Górnicka presents us with the aporias of identity politics, where we either regard the ‘other’ as a threat and seek to eliminate her, or construct a new identity based on ‘political correctness’ which, however, reproduces mechanisms of negation by repressing ‘the alien’ within it, and thus leads into a blind alley of liberal democracy. In Constitution for a Chorus of Poles as well as in Hymn to Love, the chorus confronts us with the implications of biopolitics which targets the sphere of what remains in phantasmatic relation, being ‘alien’, to what is recognised as ‘our own’. The common denominator of the people who appear on stage is their absolute diversity: in other words, a clear denominator is absent. As I have sought to demonstrate, in both Constitution for a Chorus of Poles and Hymn to Love, a chorus of diverse people alludes explicitly to the current context of Polish as well as European politics. However, each of these works has a rather different take on issues of national and communitarian identity. In Constitution for a Chorus of Poles, the chorus comes up with a strategy of moving beyond biopolitics and all manner of identity politics by referencing the constitution and performatively reiterating the text of that document. Thus the chorus reveals the deeply democratic aspect of the constitution: one that has less to do with its content and more with the way discourse itself operates. In contrast, in Hymn to Love, Górnicka offers a pessimistic assessment of models of democracy based on ostensible diversity: taking into account the historic background of biopower, the director depicts the aporic position of the mode of politics entailing a veneer of political correctness. She shows us the blind alleys of a seemingly open society, where the ‘other’ continues to be objectified and negated. The role of the chorus as an institution situated between the extra-diegetic world and diegetc representation peculiar to theatre is a significant aspect of both productions. Thus the chorus is more than simply a medium for epitomising political discourses. Instead, it constitutes an attempt to become the reflection of a society no longer based on antagonising identity mechanisms, but founded instead on a utopian model of democracy as res publica. In other words, it is an attempt at reflecting the mechanism of absolute discursiveness. Górnicka’s return to the order of representation in Hymn to Love (and, consequently, the fact that she turns away from the chorus as an institution) may therefore be understood as conceding that the institution of the chorus is no longer sufficient. Aside from discursiveness on stage, there is also the issue of changing that stage’s institutional framework – as well as the issue of ‘real politics’ in need of strong institutions. 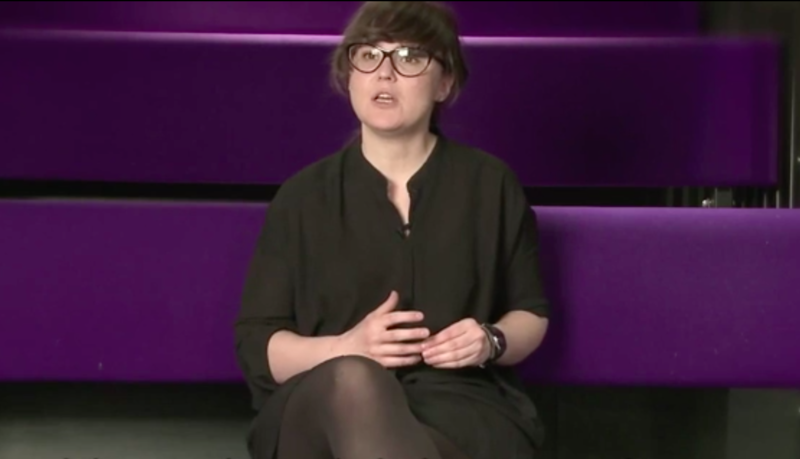 Firmly embedding things that are in action on stage within the institutional structure of theatres and arts organisations would be a step towards bringing these aspects closer together. What is needed are genuine interactions: the artistic and organisational aspects of a performance need to work alongside one another. Steps of this kind were taken several years ago as part of immigration policy: examples include Berlin’s Maxim Gorki Theatre and Ballhaus Naunynstrasse. Most of the people employed in these theatres have immigrant backgrounds. However, this is not solely a matter of identity politics: in this particular context, the category of post-migration, often referenced with regard to these theatres, draws our attention to the fact that the determinants of individual identity remain in flux.45 The demographic situation in Germany is obviously different than in Poland, and there can be no question of simply transposing the same solutions. Some basic features of those institutional practices are discernible at the aesthetic level of Górnicka’s work, including the incessant, radical questioning of the certainty of the political subject by depicting things that disrupt the ostensible dialectics of ‘the alien’ and ‘our own’. When it comes to their institutional space, Polish theatres have thus far taken no similar action. Yet Hymn to Love – the first of Górnicka’s works to be shown at an institutional theatre in Poland, and one that, rather than being an event or a performance, enjoys the life of a regular theatre production that is part of the repertoire – can be read as a call for institutional change, for undertaking more profound structural work with a view to setting up an institution as res publica. Butler, Judith, Gender Trouble: Feminism and the Subversion of Identity (New York: Routledge, 2008). Iser, Wolfgang, The Fictive and the Imaginary: Charting Literary Anthropology, trans. David Henry Wilson, Iser (Baltimore: Johns Hopkins University Press, 1993). Parr, Adrian, The Deleuze Dictionary (New York: Columbia University Press, 2005). 1. Benedict Anderson, Imagined Communities: Reflections on the Origin and Spread of Nationalism (London, New York: Verso, 2006). 2. Eric Hobsbawm, Terence Ranger, The Invention of Tradition (Cambridge: Cambridge University Press, 2012). 3. Volker Gerhardt, Öffentlichkeit die politische Form des Bewusstseins (Munich: C.H. Beck, 2012), p. 10; see Jürgen Habermas, The Structural Transformation of the Public Sphere, trans. Thomas Burger with Frederick Lawrence (Cambridge: Polity, 1989). 4. Dariusz Kosiński, Teatra polskie. Historie (Warsaw: Instytut Teatralny im. Zbigniewa Raszewskiego, 2013), p. 21. See Kosiński, Teatra polskie. Rok katastrofy (Warsaw, Kraków: Instytut Teatralny, Wydawnictwo Znak, 2013). 5. 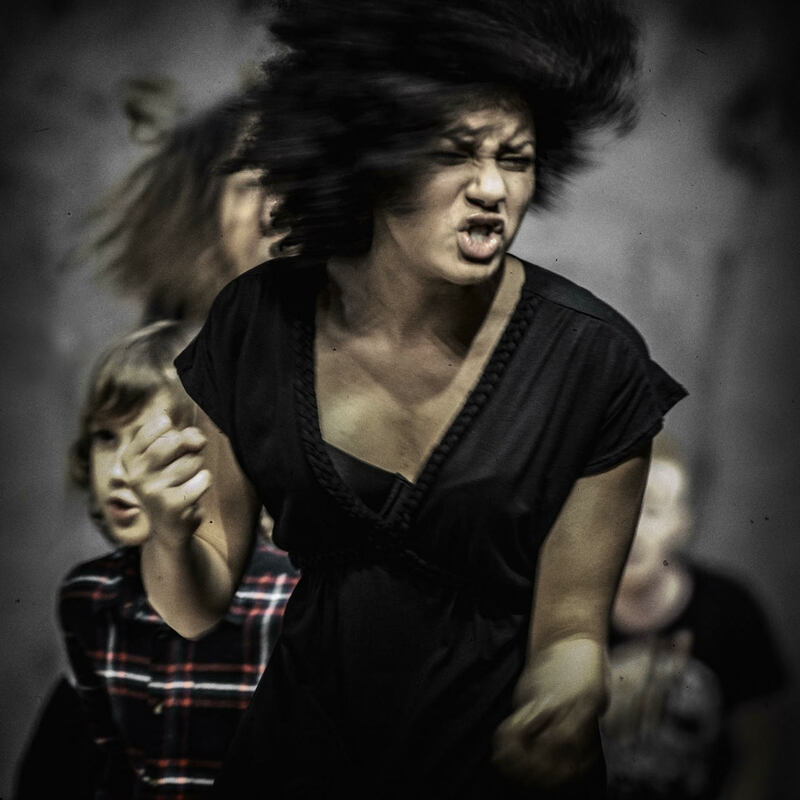 On 26 September 2013, The Chorus for Roma People, based on a libretto spoken by inhabitants of the Roma ghetto,was first shown in Košice, Slovakia. On 11 December 2014, Mother Courage Won’t Remain Silent: A Chorus for Wartime premiered at the Museum of Modern Art in Tel Aviv. The latter was the first part of a triptych based on themes from Bertolt Brecht’s Mother Courage. 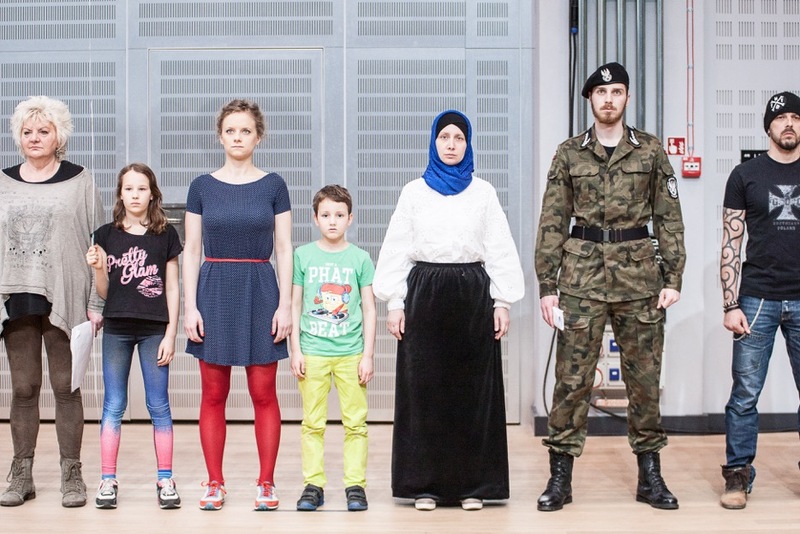 In it, the sixty-member chorus was made up of ‘Arabic and Jewish mothers, Israeli soldier-dancers, Arabic children.’ The second part of the triptych, M(other) Courage, premiered on 25 September 2015 in Brunswick, Germany. Hymn to Love premiered at the Polski Theatre in Poznań, and closes the triptych. www.martagornicka.com [accessed on 24 May 2017]. 6. An interview with Marta Górnicka for culture.pl, www.youtube.com [accessed on 24 May 2017]. 7. In contrast to her later works, which included performers of all genders. 8. Agata Łuksza, ‘I’m Calling Out to You: On the Choral Theatre of Marta Górnicka’, Polish Theatre Journal, 1 (2015), www.polishtheatrejournal.com [accessed on 24 May 2017]. 9. Łuksza, ‘I’m Calling Out to You’. 10. www.berlinerfestspiele.de, [accessed on 8 January 2017]. 11. See ‘Siła Chóru. Niesterowane głosy’,Agata Adamiecka-Sitek and others in conversation, Dialog, 1 (2012). 12. Łuksza, ‘I’m Calling Out to You’, p. 8. 13. ‘Siła chóru. Niesterowane głosy’. 14. Judith Butler, Gender Trouble: Feminism and the Subversion of Identity (New York: Routledge, 1990), p. 43. 15. Adrian Parr, The Deleuze Dictionary (New York: Columbia University Press, 2005), p. 25. 16. 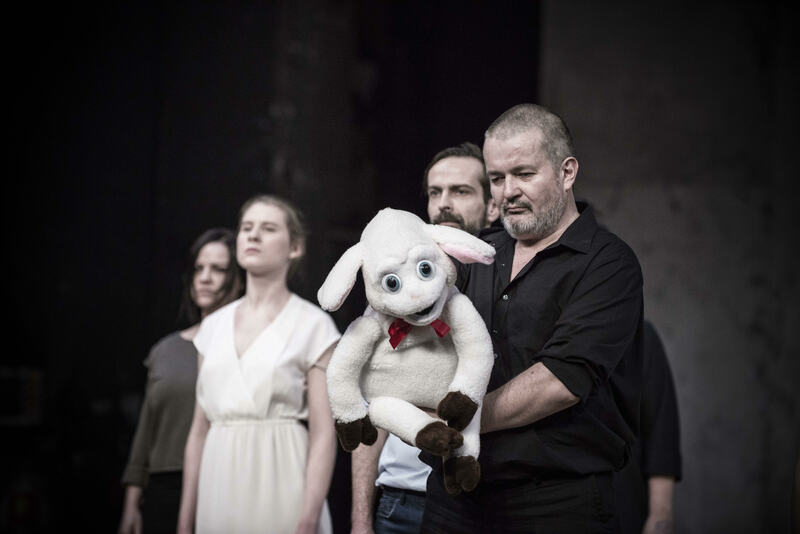 Detlev Baur, Der Chor im Theater des 20. Jahrhunderts Typologie des theatralen Mittels Chor (Tübingen: Niemeyer, 1990), p. 26; see Albert Henrichs, ‘"Why Should I Dance? ": Choral Self-Referentiality in Greek Tragedy’, Arion: A Journal of Humanities and the Classics, 3:1 (1994), pp. 56–111. 17. The concept of diegesiswas first introduced by Gérard Genette. See Genette, Narrative Discourse: An Essay in Method, trans. Jane E. Lewin(Ithaca: Cornell University Press, 1980). 18. Baur, Der Chor im Theater, p. 28. 19. Baur, Der Chor im Theater, p. 27. All sources from German in my Polish translation. 20. Baur, Der Chor im Theater, pp. 23–24. 21. ‘Fiction’, in that sense of the term, does not indicate a distinct, ‘imagined’ world, but – in the sense of ‘ficitveness’ – points to the fact that the circumstances are feigned, constructed. See Wolfgang Iser, Fictive and the Imaginary: Charting Literary Anthropology, trans. David Henry Wilson, Iser(Baltimore: Johns Hopkins University Press, 1993). 22. See Benjamin Wihstutz, Der andere Raum Politiken sozialer Grenzverhandlung im Gegenwartstheater (Zurich: Diaphanes, 2012). 23. See Lorenz Aggermann, Georg Döcker, Gerald Siegmund, Theater als Dispositiv. Dysfunktion, Fiktion und Wissen in der Ordnung der Aufführung (Frankfurt: Peter Lang, 2017); Giorgio Agamben, What Is an Apparatus? and Other Essays, trans. David Kishik, Stefan Padatella (Stanford: Stanford University Press, 2009). 24. Yet another analogy with the classical chorus is discernible here: as Delev Baur has emphasized, the classical chorus did not represent the people in their entirety, it was not a reflection of the polis. In classical dramatic works, the chorus represented a ‘clearly defined, narrow group of people’, frequently a group of excluded people (a chorus of women or the elderly). The chorus should be understood as an exception facing the norm, but not located (placed) outside the norm. See Baur, Der Chor im Theater, p. 25. 25. ‘The mechanism of the exception is different. While the example is excluded from the set insofar as it belongs to it, the exception is included in the normal case precisely because it does not belong to it. And just as belonging to a class can be shown only by an example – that is, outside of the class itself – so non-belonging can be shown only at the center of the class, by an exception. In every case (as is shown by the dispute between anomalists and analogists among the ancient grammarians), exception and example are cor­relative concepts that are ultimately indistinguishable and that come into play every time the very sense of the belonging and commonality of individuals is to be defined’ Giorgio Agamben, Homo Sacer: Sovereign Power and Bare Life, trans. Daniel Heller-Roazen (Stanford: Stanford University Press, 1998), p. 22. 26. Carl Schmitt, Political Theology: Four Chapters on the Concept of Sovereignty, ed. and trans. George Schwab (Chicago: Chicago University Press, 2005), p. 15. 27. Agamben, Homo Sacer, pp. 15–29. 28. See Giorgio Agamben, Means Without End: Notes on Politics, trans. Cessare Casarino, Vittorio Binetti (Minneapolis: University of Minnesota Press, 2000), pp. 29–34. Sebastian Kirsch points out the connection between chorus in theatre and Agamben’s category of ‘the people’; see Kirsch,‘Gibt es einen richtigen Chor im falschen? Von der Pest und vom Glück des Volkes’, Maske und Kothurn, 60:2 (2014), pp. 43–54. 29. Agamben, Means Without End, p. 31. 30. See Przemysław Czapliński’s commentary on this kind of politics, especially to affective politics: bliscynieznajomi.pl [accessed on 4 January 2017]. 31. The Heidegger Reader, ed. Günter Figal (Bloomington, Indianapolis: University of Indiana Press, 2007), p. 261. 32. Jacques Derrida, ‘Declarations of Independence’, New Political Science, 15:10 (1986), pp. 7–15. 33. Górnicka’s libretto includes articles from the preamble and the two opening chapters of the constitution. 34. The Constitution of the Republic of Poland of 2 April 1997; according to the preamble: ‘The Constitution of all who […] will practise it’ (emphasis added). 35. Oliver Marchart, Post-foundational Political Thought: Political Difference in Nancy, Lefort, Badiou and Laclau (Edinburgh: Edinburgh University Press, 2007), p. 2. 36. Judith Butler, ‘What Is Critique? An Essay on Foucault’s Virtue’, in The Political,ed. David Ingram(Malden, Oxford: Blackwell Publishers, 2002), pp. 212–228. 37. Jean-Luc Nancy, The Inoperative Community (Minneapolis: University of Minnesota Press, 1991), pp. 2–3. 38. In the Polish context, one can follow this through in keeping with the ‘fear of affection’ principle. See Grzegorz Niziołek, ‘Lęk przed afektem’, Didaskalia,131:11 (2016), pp. 9–17. Mechanisms revealed by the chorus are peculiar to Western societies. Anders Breivik is mentioned later in Hymn to Love, and his manifesto ‘2083: A European Declaration of Independence’is quoted from extensively. This calls to mind events in Germany in 2012: during the ‘Power and Dissent’congress in Weimar, the premiere of Breivik’s Erklärung, directed by Milo Rau, was cancelled. For the performance, one member of the cast, a German actress of Turkish origin, reads aloud the statement Breivik delivered during his trial. Opening night was moved instead to a cinema not far from the theatre: according to the theatre’s artistic director, the production could not be shown at his venue because transformation of the source material had been insufficient to be regarded as a work of art. See derstandard.at, 19 January 2017. 39. Grzegorz Niziołek, Polski Teatr Zagłady (Warsaw: Instytut Teatralny im. Zbigniewa Raszewskiego, 2013), p. 306. 40. Gerald Siegmund,‘Stimm-Masken: Subjektivität, Amerika und die Stimme im Theater der Wooster Group’, in Stimme-Klänge-Töne: Synergien im szenischen Spiel, ed. Hans-Peter Bayerdörfer (Tübingen: Gunter Narr, 2002), pp. 69–79. 42. Niziołek references the cancelled production of Nie-boska Komedia. Szczątki at the Stary Theatre in Kraków in 2013. See Niziołek, Polski Teatr Zagłady and Agata Adamiecka-Sitek, ‘Dzieje Grzechu. Nie-boska komedia, Żydzi i doświadczenie estetyczne’, Didaskalia, 126(2015), pp. 22–31. 43. See Giorgio Agamben, ‘Homo Sacer: Sovereign Power and Bare Life’,in Remnants of Auschwitz: The Witness and the Archive, trans. Daniel Heller-Roazen(New York: Zone Books, 1999). 44. See Guido Fackler, Des Lagers Stimme: Musik im KZ: Alltag und Häftlingskultur in den Konzentrationslagern 1933 bis 1936: mit einer Darstellung der weiteren Entwicklung bis 1945 und einer Biblio-/Mediographie (Bremen: Temmen, 2000). 45. Azadeh Sharifi, ‘Theater und Migration. Dokumentation, Einflüsse und Perspektiven im europäischen Theater’, in Das freie Theater im Europa der Gegenwart. Strukturen - Ästhetik – Kulturpolitik, ed. Manfred Brauneck (Bielefeld: Transcript, 2016), pp. 335–430.